Hmmm...Should I Even Try to Make Another Promise? Down 5 pant sizes! Woo! Hoo! Yesterday afternoon Rowan and I went over to Nadine's school for her halloween party. Most of the afternoon at school was dedicated to the party and the halloween parade! One of my Daisy mom's, Kirsten coordinated Nadine's class party. She did a fantastic job! I enjoyed it because I was able to go and just enjoy! I didn't have to take anything or lead any games, I just went and watched. Rowan played quietly with all their classroom toys until the candy came out and then he was on top of making sure that he was included in the distribution. The day ended with the halloween parade. All of the kids in the school, in class order, paraded out of the school and around the building. Nadine's class was the caboose. Rowan say patiently on the ground waiting for his big sister to round the corner and pass by him! My only negative comment for the day was "What are some parents thinking when it comes to dressing their girls in costumes!" This was elementary and some of those girls were wearing adult provocative costumes. After much searching, we found a sitter for last night! Rob and I joined, Uncle Jeff, Aunt Diane, Jeremy, his girlfriend Laurie and Jenna to go see Jenna's girlfriend Suzi in the live performance of the Rocky Horror Picture Show put on by the Monroe Community Theatre. Besides Jenna we were all Rocky Horror virgins! It was an amazingly funny show! All of us, except Uncle Jeff and Aunt Diane had an idea of what the show was about and what to expect. But they didn't and it was hilarious to see their reactions! The audience participation was one of the best parts, just to hear people yelling back at the performers and dialoguing with the cast. It was fun! Suzi did a great job, as well as the rest of the cast! This was the first time that Laurie, Jeremy's girlfriend met any of his family. We all laughed about the initiation that we gave her going to this show! Before hand we went to eat at Carl's in Ida, MI. It was a little mexican joint! Pretty good food, slow service! Jenna had rounded up a group of 20 people to go, us and her 4H group. But we didn't know any of them. It was experience, Rob and I would love to go see it in a high budget live performance sometime. The McQueary Clan has had a busy week!!! Tuesday night, we all went over to Jourdyn's fall choir concert. The kids loved it because the choir sang Lion King songs and Somewhere out There from An American Tail, which we just watched a couple of weeks ago. Rowan had some issues with wanting to sit still but overall did really well. Wednesday night the kids had their harvest party at church for Caravans. They had a ball. Rowan is a cowboy this year and Nadine is a cheerleader! Jourdyn wanted to be an alien but we couldn't find what she wanted to wear. She didn't want to budge and compromise so she is nothing. Of course, she likes to stay at Grandmas and pass out candy on Halloween anyways instead of Trick or Treating. We are doing our usual for Halloween, going to Grandma McQueary's to Trick or Treat and have warm potato soup!!! The kids are so excited! Not so much for the soup but for the candy! That's okay I'll eat the soup! Thursday, Nadine was off of school for parent/teacher conferences, and the HS and MS closed for fog. That didn't stop Jourdyn's GT class from heading to Cleveland for the Chamber Theatre Production of Encore - a series of short stories. I chaperoned. So 50 of us (Jourdyn class and the other MS's GT class) piled on a bus and made the 2 hour trip. It was fun. The kids were a little bummed that they had to go even though school was canceled, but in the end they really enjoyed it and I think they would have been sad to miss it. We saw Edgar Allan Poe's "The Tell Tale Heart," Washington Irving, "The Legend of Sleepy Hollow," "The Necklace" by Guy de Maupassant, "The Monkey's Paw" by W.W. Jacobs and finally "The Celebrated Jumping Frog of Calaveras County" by Mark Twain. It was at times a little disturbing but overall a fantastic performance! This is Jourdyn and a couple of her friends. This weekend I am participating in Tent City in Downtown Toledo. So last night, a couple of my girlfriends, Andrea and Judy joined me for Tent City volunteer training. It was really neat. Basically this weekend a little city is set up to build community and help the unhoused find the resources they need to start over in life: recovery programs, housing, ID assistance, clothing, food, etc. That was the topic for our second Daisy meeting! Bernadine looks forward to her Daisy nights so much! Every Monday she asks if it's Daisy night! This week we talked about Friendliness & Helpfulness and they earned their yellow daisy petal! To earn that petal we paired off and helped each other make life-size self-portraits! Check out the pictures they are adorable! We also had a Daisy join us! So we are now 6 and going strong! The girls are just adorable and I love being able to help them grow! Our plans were for this past weekend to head down to Virginia for the Highland Games. However, the weekend just proved to be too stinkin' busy for the Greenwald's and for our family. So we stayed home. That gave us the opportunity to go to Jason and Amy's annual halloween party. We didn't put any money into costumes, except buying fake full sleeve tattoos. I went as I guess myself with full sleeve tattoo. Rob did the same. We weren't able to stay late because of the sitter situation, but it was fun to go hang out for a bit. And while we were there many celebrities showed up! Including, newly famous Balloon Boy, Slash, Madonna, and the absolute best costume, Kanye & Taylor Swift! Well, I have survived the first week of my new class! I had to write a 1000 word paper by Saturday and I have that done. Also we read and post personal reactions to the readings three times a week. And then carrying on conversation about those reactions with other classmates. Not much is different from other classes I've had. However, there is this surrealism, I really can't believe that I know have 5 weeks left until I have my Masters. That is simply unbelievable! Rob and I are still left with uncertainty about when and where God will use us. There seems to be doors opening, even just slightly here in the Toledo area. We are anxiously anticipating what God is going to do. It wouldn't be right to not mention the frustration that sometimes creeps in, but I am learning to trust Him and see what He sees. Jourdyn brought home two B's on her grade card, the rest were A's. She's doing well. Nadine needs to work on writing our last name and knowing our address and phone number but otherwise, she is doing great in school as well. Rowan is completely potty trained and has good weeks now with NO pacifer! Praise God He is good!!! During all this potty training, which is doing fabulous! I think we have achieved success! No accidents for a couple of days now, not even at night. He is on cue, going on his own. YEAH! But another life-change for Rowan is that it has been over a week since he's had his pacifier! He hasn't even asked for it! I don't know what's come over my boy. He's growing up so quickly! I received a 98.6 in my History of Christianity class! I had had a perfect score until the last week and then I slipped. Overall I am very happy with the end result! Email me if you want to see my paper. I'll email it back to you. Last night, Jourdyn had the opportunity to get out on the football field and participate in a marching band experience. Our school district has two junior highs and of course they are rivals! So every year when they play each other it becomes a huge deal! They have tailgating and just a lot of fun. It was really cold! So we didn't tailgate, in fact, Rob kept the little ones home and I went to video tape and take pictures! When Jourdyn was done, we left at half time because of the weather. But she did a fantastic job and I tried to get as much video for all you out-of-towners that I know would have been there freezing with me! Today is day 5. Day 4 went extremely well. Rowan didn't have an accident and even was putting himself on the potty, when he felt he needed to go. He told me "Mommy, you don't watch! Leave, I did it myself!" We'll see how Day 5 transpires. He has also gone three nights with no bedtime accidents. The day time accidents aren't number 1 accidents, its when he poops! So I would have to say that they aren't really accidents, they are more like refusals! When we purchased our home two and half years ago. We knew because of its age and a little peeking under the carpet that the bedrooms were solid hardwood floors beneath the carpets. A while back we tore up the carpet in our office to find damaged floors. Whoever painted previous didn't care that they were working over oak floors, so there was and still is paint all over it. The previous owners tore out some of the original hardwood in the dining room to put in linolium (now covered by carpet) but when they did they damaged the floor at the office entrance. They did ALOT of hokey stuff. Not sure of the condition of the other rooms hardwood. We have left the office floor sit, until we could decide if we would just lay pergo over it to cover the damage or if we would sand it down and refinish. Well, yesterday we decided! We tore up the carpet in Nadine and Rowan's room to reveal what really was beautiful hardwood. There is no paint all over it and it for the most part was in okay condition. There is a black stain between the dresser and bed. It's square and it's moisture damage, so we think that something was left there for a period of time (not on our watch!) The room needs sanded and refinished because it is evident that in the 40+ years that the house has been here it has never been done. But they look great for being that old. 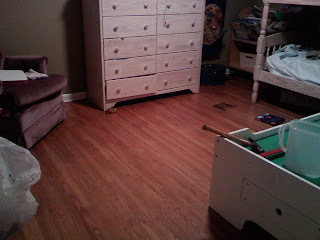 So our decision is that we will tear up the carpet in our bedroom and Jourdyn's, see what we got and then refinish them. We absolutely LOVE hardwood. Rob and I were ecstatic when tearing back the carpet revealed hope that they were taken care of better than the office area was. Of course, the office area used to be living room area way back before our time...and they did renovations to make it a 4th bedroom and a dining room, giving the house only one "living room" area. We aren't sure when they did it but we know they had no clue what they were doing when they did it. We don't use it as a 4th bedroom but instead our office. On Tuesday, I forcefully began the wonderful world of potty-training with Rowan. It's not that I haven't tried before, he has just not been interested and really just stubborn. Well, I have the week of school so, I didn't give him an option. He seems to be catching on. Today is our third day and maybe the third day will be a charm! He only had one accident each day before, hopefully today we'll get by with no accidents! My last class begins this coming Monday! Let me say that again - MY LAST CLASS BEGINS THIS COMING MONDAY!!!! YAY!!! I'm excited that I have 6 weeks remaining and than I will have my Masters. I really can't believe it. This class is Christian Theology II and from looking at the syllabus, I think it's going to be a hard one! We had over the past few months collected a couple of Build-a-Bear gift cards! So Rob and I took Rowan to Build-a-Bear a couple of weeks ago because they have a Brutus! Rowan being the boy that he is really cared more about running the stuffing machine at Build-a-Bear than the toy itself. But we got it and he loved carrying Brutus in his box through the mall and then home. Brutus even plays the Fight Song! Well, yesterday during the game, I came out of the bedroom to find Rob sitting on the couch, watching the game! And who is sitting beside him? BRUTUS! So I asked him, "who exactly did we get Brutus for?" Later, that night Nadine came up and snagged Brutus from him. He said, "Hey, give me back my Brutus!" Rowan politely tapped daddy trying to get his attention. Rob said "What Rowan?" Rowan said "Daddy, it's my Brutus!" Even though it was pouring down rain last night, Jourdyn still hit the field with the high school marching band for her marching band debut! She was minus her instrument, but out there marching all the same. Neither Marching band had their woodwind sections. The rain can cause serious damage to woodwind instruments, so those band members march along with no instruments. Of course, the band is nowhere as loud as it should be and integral parts of the music are missing, but they are still distinguishable! You have to give the kids credit to be out there being part of a team. Our district has two junior highs. The other junior high was there and participated but their band director had them take their woodwinds out because this was a one time important event. As a parent who has bought and paid for not only the instrument but repairs in the past, I was much appreciative of our directors choice to not allow the saxophones to go out in the rain. Jourdyn will have other opportunities to do this in the future! Rob kept Nadine and Rowan home because of the rain. It was just me sitting in the stands trying to keep dry and video tape at the same time! Clay played Whitmer and they were smashed 0-38. Whitmer has some pretty tall boys with very long legs. So when they got out, they were just too fast for any of Clay's boys to catch them. There hasn't been too much up around the McQueary house. Rowan is definitely over his sickness, however, I have been suffering from a horrible cough for a couple of weeks now. I ventured out to the doctors this week and was told that he thinks that it is asthma and allergies causing it all. We also had our second blood drive at Hope this week! So I spent Wednesday at the drive making sure everyone was checked in, donating and having a snack before they left! We collected 14 units of blood this time, a little less than last but it was a crazy day! Oh, and I had a birthday on Wednesday! I am now 32 years old. The day went by like any other, except that I had the blood drive. Jourdyn is playing with the High School Marching band tonight during half-time! We are very excited! I've borrowed my nephews video camera so we can get video for all you out-of-towners! Friday night, Amy and Rhonda invited me to go with them to Adrian Michigan to go to "The Haunting." It's three haunted attractions in one. It was fun because of being out with the girls. The first haunted part was a traditional haunted house. How they used their space was fantastic and required a lot of forethought and execution (no pun intended!) But lacking on the scary-ness! The second portion was a 3D House of Clowns, or something like that. We were given 3D glasses and the 3D portion was the coolest part. It was 100% 3D and they had phenomenon artists that painted all of the walls and floors. No so scary again, but really neat and made it worth the money we spent to get in. The third part wasn't scary at all, just a black maze with very little light. We didn't get too lost and were out in a matter of minutes. Amy and Rhonda are so fun to go out with! Afterwards we went to IHOP for a late meal...and even our food was bleeding!!! Not really just the strawberries!!! I am a 33 year old Christian woman, married to a wonderful man, Rob and the mother of 3 children, Jourdyn, Nadine and Rowan.